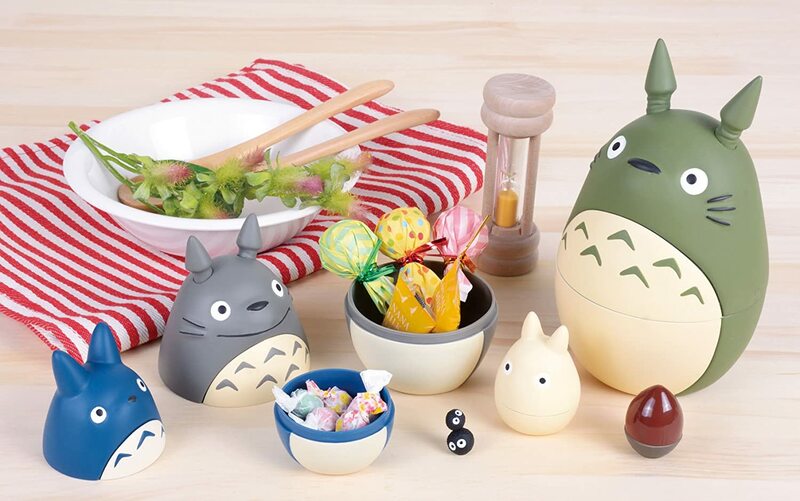 Home » Studio Ghibli Gifts » Adorable My Neighbor Totoro Nesting Dolls! These are SO CUTE! 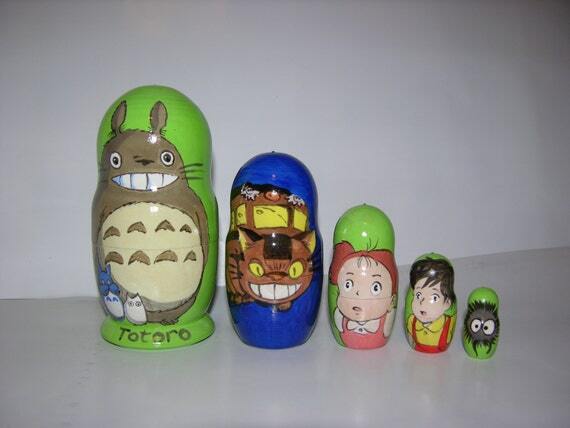 These My Neighbor Totoro Nesting Dolls remind me of a set that I got from my grandfather when I was young. I was fascinated by them! The Nesting dolls came from Russia, and were really called Matryoshka. I spent hours taking them apart and putting them back together again. I’d line them up by size… there was always a teeny tiny one at the end. Each doll could be opened up at the middle, and a smaller doll would fit perfectly inside it. 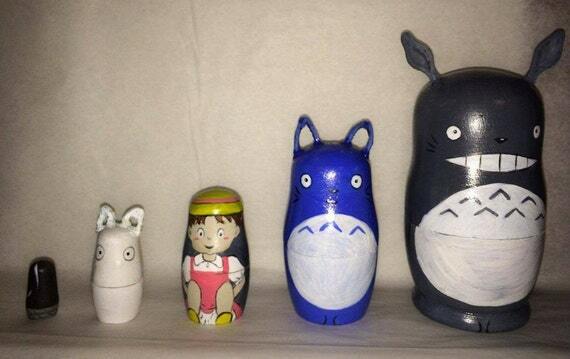 And now, you can get these Totoro Nesting Dolls! 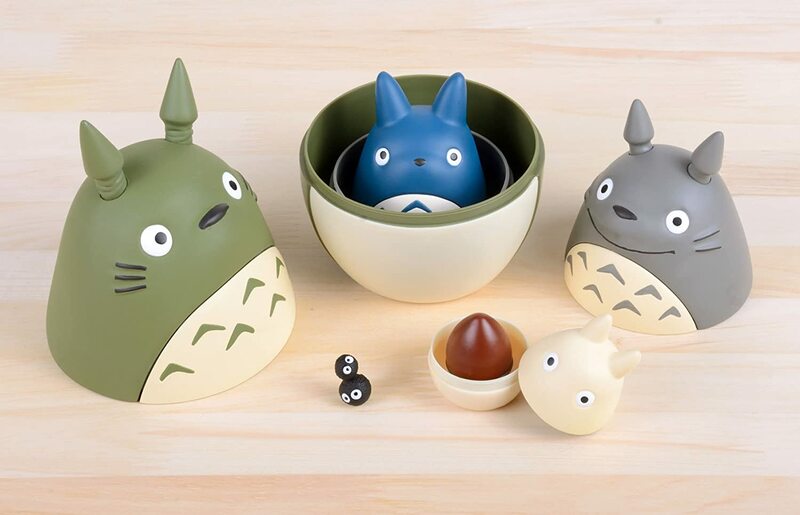 Some are just Totoros… and each of the four Totoros fit neatly into the next larger one (ending in an acorn and Soot Sprites) . 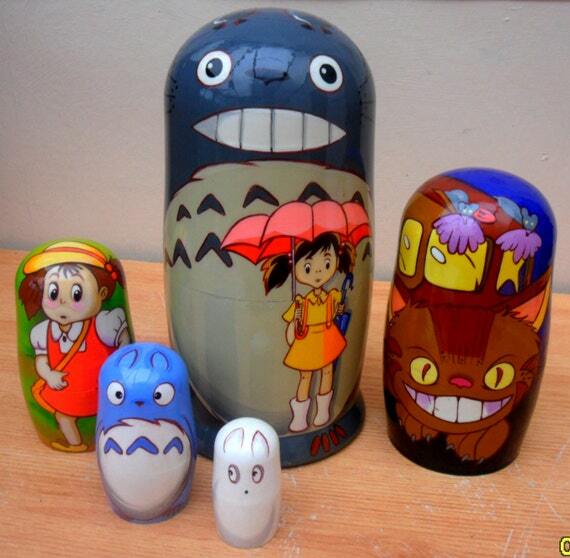 You can also get a My Neighbor Totoro Nesting Doll Set with the Totoro, Catbus, Mei and Satsuki! These nesting dolls are cute to display, but they are also fun to play with. 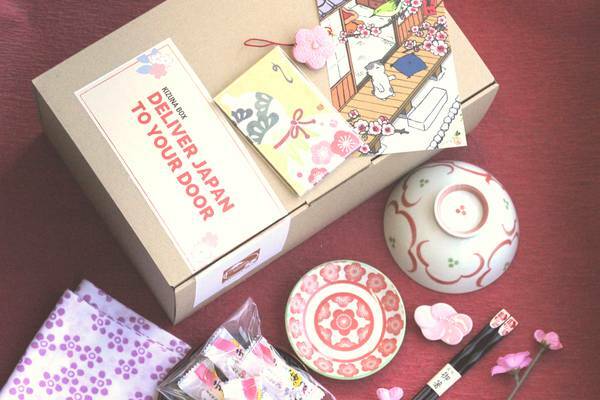 And… when they aren’t hiding inside each other, they make a great place to hide little treasures! These My Neighbor Nesting Dolls are made from Plastic… so they are quite durable. The details are perfect… even the Soot Sprites have personality! This set has 6 characters (if you can call an acorn a character). From the large Totoro, who stands 16 cm tall… down to the Soot Sprites who measure in at 2.2 cm. Each doll nests comfortably into the larger one. This set is officially licensed by Studio Ghibli! These more traditional Matryoshka are made from wood and leather. 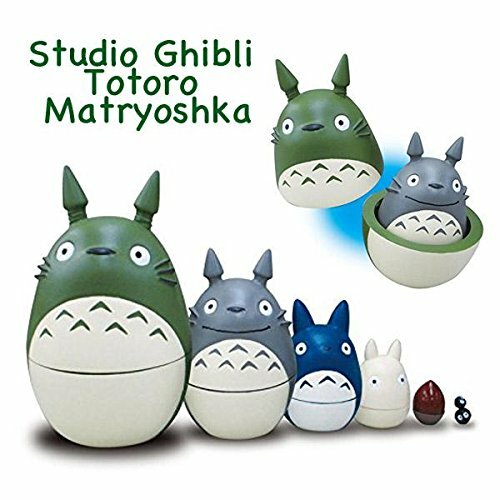 Like the other My Neighbor Totoro nesting dolls, they come apart at the middle, and can be tucked inside each other… or lined up. These dolls have different characters from the movie painted on them. 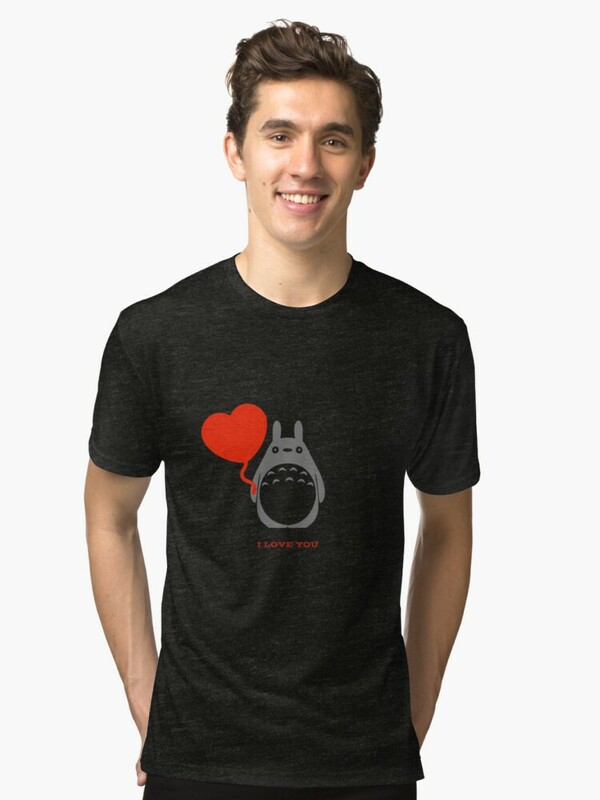 You will find Totoro, Mei, Satsuke, Catbus and Chibli! Because they are hand painted on wood, each is unique! I love the expressions on their faces… the personalities of the characters are captured so well. 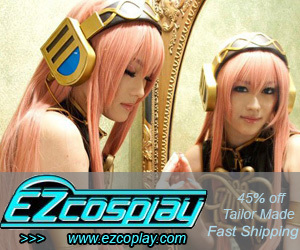 One of the sets even has leather ears! And yet they still tuck nicely into each other. This set runs 5 1/2 inches down to about 1 1/2 inches.